Mini electric car trial results | What Car? Running an electric car costs less than 2p a mile, an extensive field trial has found. 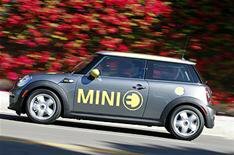 Mini leased a fleet of 40 electric Minis to a mix of fleet car drivers and private buyers over two six-month periods to help understand how such cars are used in the real world. The trial included 138 drivers who between them made 33,345 individual journeys, racking up 258,105 miles. • Four out of five people reported that 80% of their trips could be done exclusively in the Mini E.
The UK trial mirrored those in the Beijing, Berlin, on the east and west coasts of the USA, Munich, Paris, Shenzhen and Tokyo. In the UK 40 Mini Es were driven from December 2009 until March 2011. Parent company BMW says the biggest beneficiary of the research findings will be its i3 electric car, due to be unveiled at the Frankfurt motor show next month ahead of going on sale in 2013. Suzanne Gray, general manager of BMW i said: 'The feedback from the trial has been invaluable in helping our understanding of how people really respond to electric cars and other factors necessary to support electric car drivers.